Granzyme B is released from CTLs and NK cells and an important mediator of CTL/NK-induced apoptosis in target cells. The human intracellular serpin proteinase inhibitor (PI)9 is the only human protein able to inhibit the activity of granzyme B. As a first step to elucidate the physiological role of PI9, PI9 protein expression in various human tissues was studied. A mAb directed against human PI9 was developed, which specifically stained PI9-transfected COS-7 cells, and was used for immunohistochemistry. Both in primary lymphoid organs and in inflammatory infiltrates, PI9 was present in different subsets of dendritic cells. Also T-lymphocytes in primary and organ-associated lymphoid tissues were PI9 positive. Endothelial cells of small vessels in most organs tested as well as the endothelial layer of large veins and arteries showed strong PI9 staining. Surprisingly, high PI9 protein expression was also found at immune-privileged sites like the placenta, the testis, the ovary, and the eye. These data fit with the hypothesis that PI9 is expressed at sites where degranulation of CTL or NK cells is potentially deleterious. Cytotoxic cells such as NK cells and CTL form an important line of defense against virally infected cells and tumor cells. CTL and NK cells kill target cells by inducing apoptosis in the latter. This mainly occurs via two pathways, one involving the death receptor induced apoptosis (mainly the Fas ligand/Fas pathway), the other being dependent on the exocytosis of cytotoxic granules from the effector cell. Cytotoxic granules contain perforin, which forms pores in the membrane of the target cell, and several serine proteases, termed granzymes. Studies with purified components (1), transfected cells (2), and knock-out mice (3, 4) have established perforin to be essential for membrane lysis, and granzyme B to be necessary for rapid target cell DNA fragmentation and apoptosis. The signaling pathway involving Fas ligand and Fas is an important complementary route, as evidenced by the residual, slow cytotoxic activity in perforin-deficient mice, which is abrogated using target cells from Fas-deficient lpr/lpr mice (5). Importantly, the granzyme B- as well as Fas-mediated apoptosis is finally executed by unique cysteine proteases (caspases). Granzyme B shares its unusual substrate specificity with these caspases. Consequently, this mediator of cytotoxicity can directly trigger the endogenous apoptotic machinery. Recent studies indicate that normal and pathological cells can protect themselves against apoptotic stimuli at different levels. Cells of the immune system as well as certain tumor cells can express several proteins that confer resistance to Fas-mediated apoptosis, such as Fas ligand, which kills attacking cytotoxic lymphocytes, and Fas-associated death domain-like IL-1-converting enzyme-inhibitory protein (3), which directly inhibits the Fas-mediated signaling pathway (6). Fas ligand is expressed by target cells in immune-privileged sites like testis and the eye (7, 8). As the apoptotic machinery is mediated by activation of a cascade of proteases, cells could also escape apoptosis by expressing intracellular protease inhibitors. Indeed, inhibition of apoptosis has been shown for the poxvirus serine protease inhibitor (serpin) crmA, which mainly inhibits caspase 1, but may also inhibit Fas-mediated apoptosis by inhibition of caspase 8 (reviewed in Ref. 9). Furthermore, the human intracellular serpin plasminogen activator inhibitor 2 (PAI-2)3 can protect cells from TNF-induced apoptosis (10). CrmA and PAI-2 both belong to the subfamily of OVA serpins that are usually present as intracellular cytoplasmic proteins (9). The function of these serpins is largely unknown. Recently, a novel human intracellular serpin, proteinase inhibitor (PI) 9, was described to be expressed by CTLs. This serpin efficiently inhibits granzyme B in vitro and in vivo and, hence, PI9 transfected cells are protected against granzyme B mediated apoptosis (11, 12). Using RT-PCR and Northern blotting it was shown that PI9 mRNA is mainly expressed by B and T cell lines and, therefore, it was proposed that PI9 protects CTLs against death induced by their own misdirected granzyme B (11). At the moment PI9 is the only human inhibitor known to interfere with granzyme B mediated apoptosis. As a first step to resolve the (patho)physiological function of this inhibitor, we decided to study the expression of this inhibitor in various human tissues. COS-7 cells (CRL-1651; American Type Culture Collection, Manassas, VA) were described in Ref. 13 . YT-Indy cells were kindly provided by Dr. C.J. Froelich (Department of Research, Evanston Hospital, Northwestern University, Evanston, IL). DMEM and IMDM were obtained from Bio-Whittaker Europe (Verviers, Belgium). FBS was purchased from Life Technologies (Rockville, MD). All primers were synthesized by Eurogentec (Brussels, Belgium). Qiaex II Gel Extraction Kit and Qiagen Plasmid Maxi Kit were obtained from Qiagen (Hilden, Germany). The pCR-Script Amp SK+ cloning vector was obtained from Stratagene (La Jolla, CA) and pcDNA3.1/Hygro+ from Invitrogen (Carlsbad, CA). Epicurian Coli XL1-Blue MRF’Kan super competent cells were obtained from Stratagene, and JM109 high efficiency competent cells were obtained from Promega (Madison, WI). The Thermo Sequenase DNA sequencing kit was purchased from Amersham (Arlington Heights, IL). mAb GB7 (subtype IgG2a) recognizing granzyme B was produced and purified as described previously (14). Anti-CD21 mAb 1F8 (subtype IgG1), anti-S100 polyclonal Ab, biotinylated rabbit-anti-mouse F(ab′)2 Ig, biotinylated swine-anti-rabbit F(ab′)2, HRP-conjugated rabbit-anti-mouse Ig, avidine-biotine-HRP complex (sABC), biotinylated tyramine, and streptavidine-FITC were obtained from Dako (Glostrup, Denmark). Biotin-labeled goat-anti-mouse IgG1 and HRP-labeled goat-anti-mouse IgG2a Abs were obtained from Southern Biotechnology Associates (Birmingham, AL) and tyramine-rhodamine from DuPont Pharmaceuticals (Wilmington, DE). The constructs PI6-pcDNA3 and PI8-pcDNA3 were a kind gift from Dr. W. Kisiel (Department of Pathology, University of New Mexico, Albuquerque, NM). PAI-2-pCI-neo was kindly provided by Dr. E.K. Kruithof (Division of Angiology and Hemostasis, University Hospital Geneva, Geneva, Switzerland). FuGENE 6 transfection reagent was obtained from Roche Molecular Biochemicals (Indianapolis, IN). 4-(2-aminoethyl)-benzenesulfonylfluo-ride.HCl was obtained from A.G. Scientific (San Diego, CA) and apo-transferrine from Sigma (St. Louis, MO). The Micro BCA Protein Assay was obtained from Pierce (Rockford, IL). COS-7 cells were grown in DMEM supplemented with 10% (v/v) heat-inactivated FBS, 2 mM l-glutamine and penicillin/streptomycin at final concentrations of 50 IU/ml and 50 μg/ml, respectively. YT-Indy cells were cultured in IMDM containing 10% (v/v) heat-inactivated FBS, 2 mM l-glutamine, 50 IU/ml penicillin/50 μg/ml streptomycin, and 20 μg/ml apo-transferrine. All cells were maintained under an atmosphere of 5% CO2/95% air in a humidified incubator at 37°C. To obtain cell lysates, cells were pelleted, washed twice with PBS (pH 7.4), and resuspended in PBS with 1% (w/v) Nonidet P-40 at a concentration of 40 × 106 cells/ml. YT-Indy cells were also lysed in PBS/1% Nonidet P-40 supplemented with a protease inhibitor mixture consisting of 1 mM 4-(2-aminoethyl)-benzenesulfonylfluoride·HCl, 10 mM EDTA, 10 mM benzamidine, 5 mM N-ethylmaleimide, 1 μg/ml pepstatin and 50 μM iodoacetamide. Cells were lysed for 30 min on ice, whereafter the lysate was centrifuged for 10 min at 3000 rpm to remove cell debris and DNA. The supernatant (cell lysate) was stored at −20°C until further use. Construction and amplification of the cDNA coding for the entire PI9 protein was achieved by PCR with primers 5′-GGATTCCCATATGGAAACTCTTTCTAA-3′ (sense) and 5′-CGGAATTCTATGGCGATGAGAACCTGC-3′ (antisense). The primers were deduced from the N- and C-terminal ends of the published cDNA sequence for human PI9 (15) and NdeI and EcoRI restriction sites were introduced in the sense and antisense primers, respectively. PCR was performed on first strand cDNA prepared with random hexamer primers from RNA extracted from a BJAB cell line. The PCR product was purified by agarose gel electrophoresis and isolated from the gel with Qiaex II Gel Extraction Kit. The purified cDNA was ligated blunt end into the SrfI site of the pCR-Script Amp SK+ Cloning Vector and transformed to Epicurian Coli XL1-Blue MRF’Kan super competent cells according to the manufacturer’s instructions. The authenticity of the cloned cDNAs was confirmed by nucleotide sequence analysis according to the Thermo-Sequenase protocol. The PI9 cDNA was cut from PI9-pCR-Script by digestion with NdeI and EcoRI and subcloned into the expression vector pRSET6A yielding expression under the control of the T7 RNA polymerase promoter. For the expression of rPI9, the plasmid PI9-pRSET6A was transformed to the Escherichia coli expression host BL21(DE3)pLysE, which expresses T7 RNA polymerase under the control of the isopropyl-β-d-thio-galactopyranoside-inducible lac UV 5 promoter. Several colonies were used to inoculate LB medium supplemented with ampicillin and chloramphenicol and the bacteria were grown at 37°C until the absorbance at 600 nm was between 0.3 and 0.5. To induce rPI9 expression, isopropyl-β-d-thio-galactopyranoside was added to a final concentration of 1 mM and the cells were grown for an additional 4 h. The cells were harvested by centrifugation at 4,000 rpm for 15 min and resuspended in TE buffer (10 mM Tris-HCl (pH 8.0), 1 mM EDTA) containing 1 mM phenylmethylsulfonyl fluoride. Cells were lysed by three freeze/thaw cycles and sonication. Insoluble inclusion bodies, containing the rPI9, were pelleted by centrifugation at 14,000 rpm for 15 min and washed twice with 0.5% (w/v) Triton X-100 in TE buffer. Purified rPI9 inclusion bodies were resuspended in PBS to a final concentration of ∼1 mg/ml, shortly sonicated, and used for immunization. Female BALB/c mice were immunized both s.c. and in the footpads with 50 μg of purified rPI9 inclusion bodies suspended in CFA. This was followed by one or two subsequent booster injections of 50 μg inclusion bodies suspended in IFA at 10-day intervals. Three days after the last booster injection, popliteal lymph nodes were collected. Lymphocytes were isolated and fused with mouse Sp2/0 myeloma cells as described previously (16). Hybridomas producing immunoreactive anti-PI9 mAbs were identified by screening culture medium of the hybridomas with ELISA on immobilized, rPI9 containing bacterial E. coli BL21 (DE3)pLysE lysate. Selected anti-PI9-producing hybridomas were subcloned by three cycles of limiting dilution. Anti-PI9 mAbs were purified from conditioned medium by protein A-Sepharose affinity chromatography. Slides with sections of formalin-fixed, paraffin-embedded normal human tissues were obtained from the tissue bank of the Department of Pathology at the Free University Hospital (Amsterdam, the Netherlands). All tissues were sampled from surgical specimens within 2 h of resection. Tissues were processed routinely by fixation in 10% formalin for 18 h and subsequently embedded in paraffin. Three-micrometer thick sections were mounted on poly-L-lysine-coated slides. Cytospins of serpin-transfected COS-7 cells (see below) were fixed in 10% formalin for 1 h.
Endogenous peroxidase activity was blocked by incubation for 30 min with 0.3% (v/v) H2O2 in methanol. Unless stated otherwise, tissue sections and cytospins were subjected to Ag retrieval by boiling in 0.01 M sodium-citrate (pH 6) for 10 min in a microwave oven. In case sections were stained for the dendritic cell marker S100, reactivity was enhanced by incubation with 0.5% (w/v) trypsin in 0.5% (w/v) CaCl2 for 30 min at 37°C. Tissue sections and cytospins were stained for PI9 with purified mAb 17 at 2.5 and 10 μg/ml, respectively. To identify specific cell populations, sequential sections of several tissues were incubated with the appropriate Abs against various cell markers. In the figures, staining with the following Abs is shown: anti-granzyme B mAb GB7 1:500 (1.2 μg/ml), anti-CD21 mAb 1F8 1:25 and anti-S100 polyclonal Ab 1:400. The secondary Ab was biotinylated rabbit-anti-mouse F(ab′)2 Ig 1:500 diluted or biotinylated swine-anti-rabbit F(ab′)2 1:300 in case the first Ab was a mouse monoclonal or a rabbit polyclonal Ab, respectively. Biotinylated secondary Abs were detected with sABC. On tissue sections stained for cell markers, bound Abs were visualized by incubation with diaminobenzidine/H2O2. However, PI9 stained tissue sections were further incubated with biotinylated tyramine. After a second incubation with sABC PI9 was visualized with 3-amino-9-ethylcarbazole. Cytospins of transfected COS-7 cells were incubated with 3-amino-9-ethylcarbazole directly after the first incubation with sABC. Slides were counterstained with hematoxylin and mounted. Negative control slides were stained with mouse IgG of the appropriate subclass. For colocalization of PI9 and granzyme B double immunofluorescence staining was performed on sections of tonsil tissue as follows. After Ag retrieval, sections were stained with mAb 17 at 2.5 μg/ml as well as with GB7 at 12 μg/ml for 1 h. PI9 was detected by subsequent incubation with biotin-labeled goat-anti-mouse IgG1, sABC, biotinylated tyramine, and streptavidine-FITC. After blocking the remaining peroxidase activity with 0.3% (v/v) H2O2 in methanol, sections were incubated with HRP-labeled goat-anti-mouse IgG2a followed by tyramine-rhodamine to detect granzyme B. Sections were counterstained with 4′,6′-diamidino-2-phenylindole and mounted. The PI9-pCR-Script construct was used as a template in a PCR with primers containing either BamHI or EcoRI restriction sites (sense primer 5′-TCGGATCCCATATGGAAACTCTTTCT-3′and antisense primer 5′-ACGAATTCTTATGGCGATGAGAACCT-3′). The resulting PCR product was ligated between the BamHI and EcoRI sites of the cloning vector pBluescript. Subsequently, a cDNA fragment harboring the region coding for the entire PI9 protein was excised from the pBluescript vector with BamHI and ApaI. The excised fragment was ligated into the mammalian expression vector pcDNA3.1/Hygro. The constructs PI8-pcDNA3 and PI6-pcDNA3 comprised the cDNA sequence coding for either the full-length PI8 or PI6 protein as an insert in the expression vector pcDNA3. A cDNA fragment coding for the PAI-2 protein was present as an insert in the expression vector pCI-neo. Each of these expression vectors contains an SV40 origin of replication for amplification to high copy number in COS monkey cells and a cytomegalovirus promoter for transcription of inserted cDNA. Plasmid DNA was amplified by transformation to JM109 cells and isolated with Qiagen plasmid maxi kit. A total of 2 × 105 COS-7 cells were grown in 25 cm2 culture flasks for 24 h in DMEM with 10% heat-inactivated FBS, antibiotics, and l-glutamine. Medium was refreshed just before transfection with 3.8 μg isolated PI9-pcDNA3.1/Hygro, PI8-pcDNA3, PI6-pcDNA3, or PAI-2-pCI-neo. Control cells were transfected with empty pcDNA3.1/Hygro vector. Transfection was performed with FuGENE 6 transfection reagent. FuGENE 6 transfection reagent (microliters) to plasmid DNA (micrograms) was used in a ratio of 5:1. At 48 h after transfection, cells were trypsinized and washed twice with PBS. Part of the cells were resuspended in PBS plus 1% (w/v) BSA and used to prepare cytospins. The remaining cells were lysed in lysis buffer (PBS, 1% (w/v) Nonidet P-40) at a concentration of 3 × 106 cells/ml lysis buffer. After lysis for 30 min on ice, the lysate was cleared by centrifugation and stored at −20°C until further use. Lysates of tissue sections were prepared by dissolving five frozen tissue sections of 5-μm thick in 50 μl PBS with 1% (w/v) Nonidet P-40. Protein was measured according to the procedure of the Micro BCA Protein Assay with BSA as a standard. About 5 μg of tissue section lysate protein or 15 μl of cell lysate from transfected COS-7 cells was resolved by electrophoresis on a 10% SDS-polyacrylamide gel under reducing conditions. From YT-Indy cell lysates only 0.5–5 μl 10-times-diluted cell lysate was loaded. After electrophoresis, proteins were transferred to nitrocellulose membranes by electrophoretic blotting. The membranes were then blocked for 1 h in blocking buffer (5% (w/v) skim milk powder, 0.5% (w/v) BSA, and 0.1% (v/v) Tween 20 in PBS). Subsequently, membranes were incubated for 2.5 h or overnight with either 3.6 μg/ml mAb 17 or 8.5 μg/ml mAb 1 diluted in blocking buffer, followed by HRP-conjugated rabbit anti-mouse Ig. Bound Abs were visualized with a chemiluminescence development reagent (ECL system; Amersham) according to the manufacturer’s instructions. From a fusion experiment of a mouse immunized with recombinant human PI9 isolated from inclusion bodies, 29 mAbs were obtained. In screening experiments, one of these mAbs, mAb 17 (subtype IgG1), appeared to be specific for PI9, whereas another mAb, mAb 1 (subtype IgG2b), turned out to cross-react with several other intracellular serpins. These two mAbs were used in additional experiments. Immunohistochemistry of serpin-transfected COS-7 cells with mAb 17 supported the specificity of this mAb; it only stained PI9-transfected COS-7 cells (Fig. 1⇓A, d), but not COS-7 cells transfected with the two most homologous serpins PI6 and PI8 (Fig. 1⇓A, b and c, respectively) or with the related serpin PAI-2 (Fig. 1⇓A, a). Furthermore, in accordance with the intracellular localization of PI9, a strong cytoplasmic staining was seen with mAb 17. On Western blot, mAb 17 only recognized a 42-kDa band in lysates of PI9 transfected COS-7 cells (Fig. 1⇑B). This band is consistent with the expected size of PI9. YT-Indy cells, a NK leukemia cell line, also contained substantial levels of PI9. However, most PI9 in YT-Indy cells was present either in the form of a 67-kDa band or a 38-kDa band (Fig. 1⇑B, lane 7). The 67 kDa form appeared to be the SDS-resistant complex of PI9 and the serine protease granzyme B, because this band was also recognized by an anti-granzyme B Ab (data not shown). The 38-kDa band presumably represented PI9 cleaved in the reactive site loop by granzyme B. Both the 67-kDa complex and the 38-kDa cleaved form of PI9 disappeared at the expense of a 42-kDa band representing uncleaved serpin, when YT-Indy cells were lysed in the presence of protease inhibitors (Fig. 1⇑B, lane 6). In contrast to mAb 17, mAb 1, though raised against rPI9, also recognized a band of ∼42 kDa in COS-7 cells transfected with PI6 or PI8. 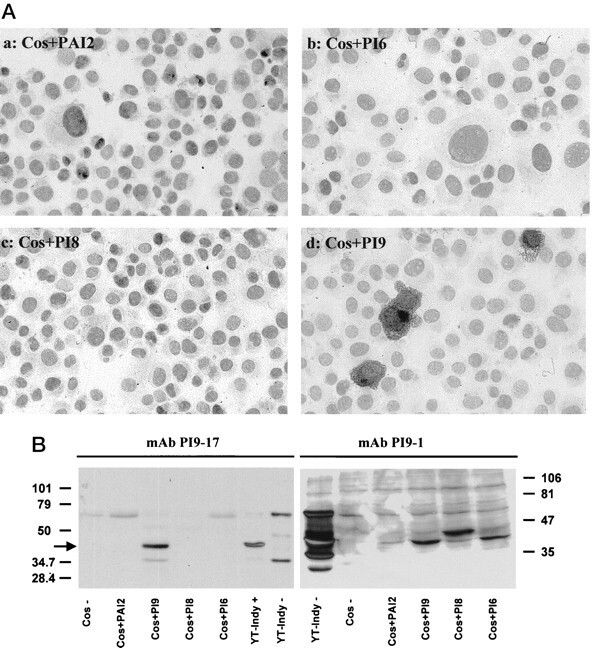 PAI-2 was not recognized although it was present in an active form in the COS-7 cells because lysates of PAI-2 transfected cells inhibited urokinase, a target protease of PAI-2 (results not shown). Notably, both mAbs also recognized a second, higher molecular mass protein band in lysates of all serpin-transfected COS-7 cells, of which the identity is unknown yet. Because this protein was not detected on the cytospins of serpin-transfected COS-7 cells (Fig. 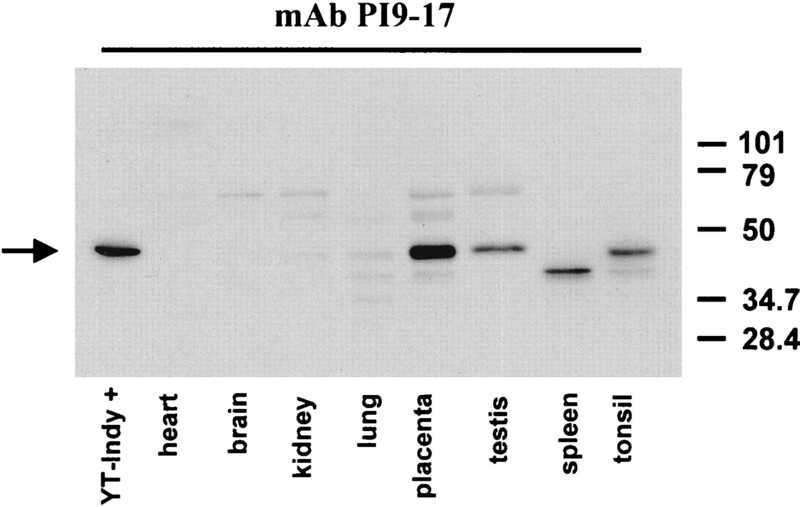 1⇑A), mAb 17 was considered to be specific for PI9 and it was used for further immunohistochemical studies. Analysis of PI9 tissue distribution (Fig. 2⇓ and 3⇓) by immunohistochemistry showed that in the lymphoid organs like tonsil (Fig. 2⇓, a–f), lymph node (not shown), thymus (Fig. 2⇓, g–i), and spleen (Fig. 2⇓, j–l) a strong cytoplasmic staining for PI9 was present in different subsets of dendritic cells. Langerhans cells in the epithelial layers (Fig. 2⇓b), follicular dendritic cells in the follicle center of tonsil and spleen (Fig. 2⇓, d and j, respectively), interdigiting cells in the mantle zone (Fig. 2⇓c, arrowhead), and dendritic cells in the medulla of the thymus (Fig. 2⇓h) showed a strong cytoplasmic staining. The identity of the PI9-positive cells was confirmed by staining with several markers like CD21 expressed in the tonsil follicular center (Fig. 2⇓e) and S100 in the thymic medulla (Fig. 2⇓i). PI9-positive dendritic cells were not only detected in the primary lymphoid organs but also in inflammatory infiltrates present in several other organs such as the prostate (Fig. 3⇓c, arrow). These cells also expressed S100 (result not shown). Several isotype control mAbs (Fig. 2⇓a) did not show any background staining in any of the organs tested. In addition, F(ab′)2 fragments of mAb17 showed an identical immunohistochemical staining pattern compared with the intact mAb, indicating that there was no specific interaction of the Fc portion of the Ab with the dendritic cells (results not shown). In contrast to dendritic cells, different macrophage subsets present in lymphoid organs, including the tingible body macrophages (see Fig. 2⇓, c and d, asterisk) or the sinus macrophages, or in nonlymphoid organs, like Kupffer cells in liver and alveolar macrophages in lung (Fig. 3⇓, d and f), were clearly negative. Various types of B cells present in the follicle center (centrocytes, centroblasts) in lymphoid organs were PI9 negative (Fig. 2⇑d). However, in the spleen several B cells, especially those present in the marginal zone, showed a strong cytoplasmic PI9 expression (Fig. 2⇑l), whereas B cells in the mantle zone showed only weak staining (Fig. 2⇑k). Mature plasma cells, present in a chronic inflammatory reaction in a patient with ulcerative colitis, did not express PI9 (Fig. 2⇑o, arrowhead). T cells present in the paracortex in lymphoid tissue and in the organ-associated lymphoid tissues like mucosa-associated lymphoid tissue were PI9 positive. Fig. 3⇑a shows PI9-positive intraepithelial lymphocytes present in the villi of the small intestine. Double staining of tonsil with anti-granzyme B and PI9 mAbs showed PI9 expression in granzyme B positive cells (Fig. 2⇑f, arrow) indicating that CTL express PI9. This was also the case in the endometrial mucosa where numerous PI9-positive lymphocytes were detected (Fig. 2⇑m). These cells represented the endometrial stromal granulocytes, also called the decidual lymphocytes, that are derived from CTL or NK cells as confirmed by the coexpression of granzyme B (Fig. 2⇑n). In contrast, only few T cells present in the thymic cortex and medulla expressed PI9, whereas most lymphocytes in this organ were negative (Fig. 2⇑, g and h). In most nonlymphoid organs tested, like the gastrointestinal tract, breast, prostate, liver, kidney, lung, brain, and heart (Fig. 3⇑, a–h), the epithelial and mesanchymal structures were PI9 negative. However, the endothelial cells of the small vessels present in these organs were strongly positive (arrows, Fig. 3⇑, d–h) and actually could be used as a positive internal control. Also in large veins and arteries (Fig. 3⇑, i and j, respectively), the endothelial layer was positive, while the smooth muscle cells present in the medium of the larger vessel wall were negative. Surprisingly, high PI9 protein expression was found in immune-privileged sites such as the eye (lens), the testis, the ovary, and the placenta (Fig. 3⇑, k–o). In the testis, PI9 was mainly localized in the Sertoli cells (Fig. 3⇑l, arrow) but low expression was also found in the spermatogonia and the primary spermatocytes. However, the Leydig cells were negative. In the ovary, the granulosa cells surrounding the primordial follicle and primary follicle (Fig. 3⇑m) were PI9 positive while the ovarial stroma was negative. The granulosa cell layer and theca interna in maturing follicles were negative (not shown). Fig. 3⇑, n and o, show placental tissue from an extra-uterine, tubal pregnancy in the first trimester. A strong PI9 expression was seen predominantly in the cytotrophoblast but hardly in the syncytiotrophoblast (Fig. 3⇑n). In Fig. 3⇑o the intermediate trophoblast (X cells) infiltrating the tubal wall is shown. These cells expressed high levels of PI9 as was also found in the chorion present in the placental membrane (not shown). The amniotic layer was negative. The same results were found in placental tissue from the second and third trimester (data not shown). No staining was observed using isotype control Abs (results not shown). 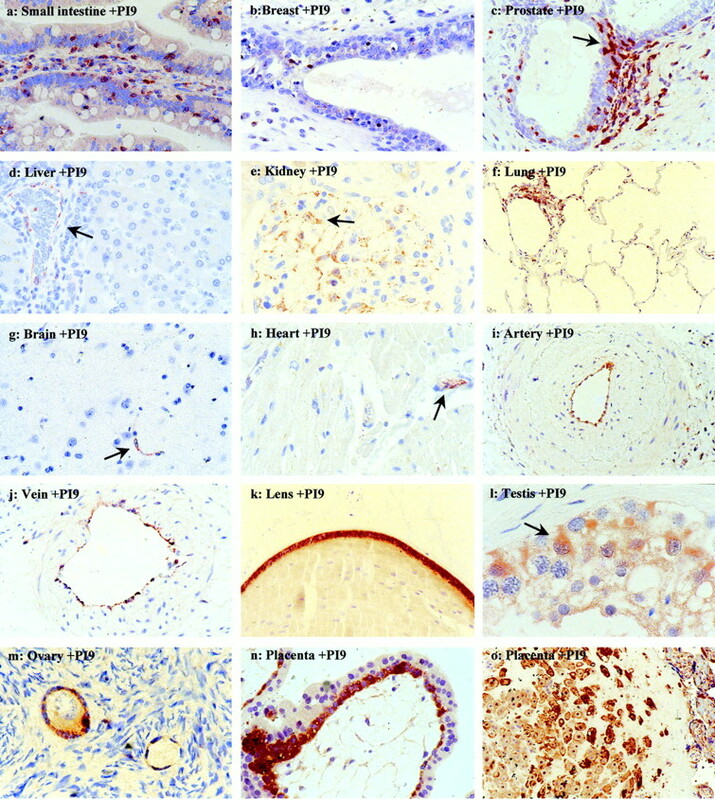 The distribution pattern of PI9 among the various tissues as seen by immunohistochemical staining, as well as the identity of the protein, was confirmed by Western blotting (Fig. 4⇓). 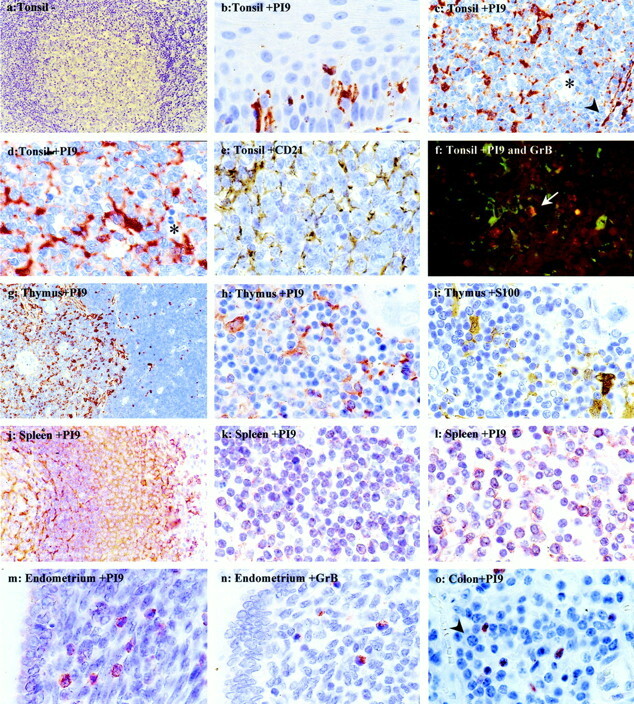 Consistent with immunohistochemistry results high amounts of PI9 were found in lymphoid tissues like tonsil and spleen and the immune-privileged sites placenta and testis. Very faint PI9 bands, probably due to PI9-positive endothelial cells present in these tissues, could be detected in lysates of kidney and lung. Lysates of heart and brain were negative for PI9. In placenta, testis, and tonsil, mAb 17 detected a band of 42 kDa, consistent with the size of uncleaved PI9 protein. In the spleen, mAb 17 recognized a band of 38 kDa, indicating that PI9 was completely cleaved in this tissue by a yet unknown protease. Immunostaining and Western blot results demonstrated that the granzyme B inhibitor, PI9, is present in many normal human tissues. However, immunostaining showed that within these tissues PI9 expression is restricted to only certain cell types. Both in lymphoid and nonlymphoid tissues high levels of PI9 were found in dendritic cells, T-lymphocytes, and endothelial cells. Other important PI9-producing cells appeared to be the intermediate trophoblastic cells in placental tissue, Sertoli cells in testis, granulosa cells in ovary, and lens cells in the eye, i.e., cells of immune-privileged sites. It was previously reported that in addition to CTLs PI9 is particularly produced in B-lymphocytes (12). These conclusions were based on analysis of PI9 protein expression in EBV-transformed B cell lines. However, immunostaining results from the present study revealed that different B cell types in lymphoid organs are negative for PI9. In contrast, B-cells present in the marginal zone in the spleen are highly positive for PI9. PI9 was absent in macrophages, plasma cells, epithelial cells, mesanchymal cells, and muscle cells. These results show that the expression pattern of PI9 protein differs from that of other OVA serpins. PI6 is predominantly synthesized in epithelial cells and capillary endothelial cells (17) that are negative and positive for PI9, respectively. In peripheral blood leukocytes, PI6 is present in monocytes and granulocytes, but not in lymphocytes (18). In contrast, in the present study PI9 was observed in T-lymphocytes in various tissues, while macrophages and neutrophils were negative for PI9. Although Northern blot analysis revealed that PI8 mRNA is widely distributed in a variety of tissues (15), the cells that produce PI8 protein are not identified yet due to a lack of specific anti-PI8 Abs. Unlike PI9, PAI-2 is mainly expressed in monocytes and macrophages (19). In contrast, both PI9 and PAI-2 are highly synthesized by trophoblast cells. Also maspin is present in the placenta where it is localized to cytotrophoblast cells (20). Maspin is associated with epithelial cells in many organs, whereas PI9 is not detected in epithelia. The detection of PI9 in T-lymphocytes is in agreement with earlier reports from studies with human leukocyte cell lines (11, 12). The function of PI9 in these cells is presumed to provide protection against their own misdirected granzyme B (11). Granzyme B is the predominant mediator of early induction of DNA fragmentation and CTL-induced apoptosis of target cells, particularly tumor cells, as has been shown in studies with knockout mice (3). PI9 efficiently inhibits granzyme B in vitro and in vivo (11, 12). This suggests that by expressing PI9 cells may become protected against a cytotoxic attack. Indeed, PI9-transfected cells resist granzyme B-induced but not Fas-induced apoptosis (11). In addition to granzyme B, also other proteases can be inhibited by PI9. PI9 binds to and inhibits the activity of the serine protease elastase (21) although with less efficiency than granzyme B (association rate constant Ka is 1.7 × 106 M−1s−1 and 1.5 × 105 M−1s−1 for complex formation of PI9 with granzyme B (12) and elastase (21), respectively). Although it is not an effective caspase inhibitor (11), PI9 has been reported to inhibit caspase 1 (22, 23) and caspase 4 (11) in vitro. Because it is a specific inhibitor of granzyme B, PI9 present in dendritic cells can be postulated to protect these cells against granzyme B released from neighboring CTLs and NK cells. Dendritic cells are also resistant to apoptosis through the Fas ligand/Fas pathway (24), the other important pathway via which apoptosis is mediated. Thus, dendritic cells seem to have more than one defense mechanism against apoptosis. The resistance of dendritic cells to apoptosis might be essential for their function as APCs and their ability to initiate an immune response. Obviously, more studies need to be done to unravel the role of PI9 in dendritic cells. Also endothelial cells have to be protected against circulating granzymes, which under certain circumstances can be present in the blood at high concentrations (25). High levels of PI9 in endothelial cells may account for the protection against granzyme B, while other serpins might interact with granzyme A. The ability of PI9 to inhibit elastase activity has been suggested to protect endothelial cells from elastase-mediated degradation of the extracellular matrix during neutrophil extravasation (21). At immune-privileged sites like placenta and testis, PI9 may be an important means for cells to escape from CTL-induced apoptosis. Trophoblastic cells invading endometrium meet many granzyme B-producing cells (Ref. 26 and Fig. 2⇑n). In testis, cells have developed mechanisms to evade immune responses. In addition to PI9 as an inhibitor of granzyme B, these organs display other strategies to maintain immune privilege and escape from unwanted apoptosis induced by activated lymphocytes. Sertoli cells, Leydig cells, and germ cells in the testis (7) as well as placental trophoblast cells (27) express Fas-L on their cell surface, that may function as an immunosuppressive agent by eliminating infiltrating Fas-expressing lymphocytes. So, on the one hand tissues produce different molecules to defend themselves against CTL-induced apoptosis. On the other hand, many tissues also express more than one serpin. For instance, in the placenta various serpins including PI9, PI6 (17), PI8 (15), PAI-2 (19), and maspin (20) are expressed. Because all these serpins contain different P1 residues in their unique reactive site loop, they will specifically inhibit different proteases. Therefore, the expression of a variety of serpins in one tissue will provide additional protection against the effects of various proteases. To fully understand the precise role of the various serpins in each tissue, further research will be necessary to determine the identity of the physiological targets of the different serpins. In conclusion, despite the widespread distribution of PI9 in many tissues, PI9 expression appears to be restricted to cell types that can meet substantial levels of granzyme B released from neighboring or circulating CTLs. Furthermore, resistance to granzyme B-induced apoptosis is absolutely essential for these cell types to keep their function. Therefore, based on its distribution, PI9 can be proposed to play a role in vivo in such diverse processes as initiation of an immune response, preserving the integrity of vessels and maintenance of immune privilege. We thank Vanessa Oude Engberink for the support of the PI9 cDNA cloning and Hans Wiessenberg for additional technical support. ↵1 This study was supported by the Dutch Cancer Foundation (Grant VU-98-1718). 3 Abbreviations used in this paper: PAI-2, plasminogen activator inhibitor 2; PI, proteinase inhibitor; sABC, avidine-biotine-HRP complex.